Firefighters Online is a community and resource center for Firefighters and Emergency Service Professionals. 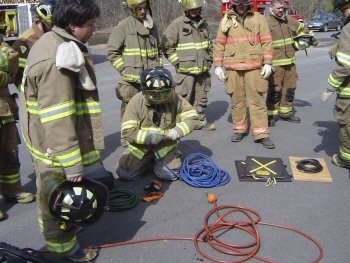 The Lancaster County Public Safety Training Center (LCPSTC) is operated through a joint operating agreement between the County of Lancaster and the Lancaster County Career and Technology Center. In addition, the Lancaster County Fireman’s Association acts as a partner in the facility. These organizations have formed this partnership in order to provide the best possible public safety training facility for use by all emergency service organizations. The NPG is intended as a source of general industrial hygiene information on several hundred chemicals/classes for workers, employers, and occupational health professionals. The NPG does not contain an analysis of all pertinent data, rather it presents key information and data in abbreviated or tabular form for chemicals or substance groupings (e.g. cyanides, fluorides, manganese compounds) that are found in the work environment. The information found in the NPG should help users recognize and control occupational chemical hazards. The latest printed edition of the NIOSH Pocket Guide is dated February 2004 (green cover, NIOSH Publication No. 97-140, third printing with minor changes) and contains information on 677 chemicals or substance groupings. Printed copies are available from NIOSH, the National Technical Information Service (NTIS), or the Government Printing Office (GPO). Full text of the 2000 ERG online. Includes French and Spanish versions as well. Learn to stay safe on-scene. Michigan State University (Emergency Response Solutions), in conjunction with Industrial Safety Consultants, Inc., has developed several online Awareness Level training programs for public and private sector emergency responders. MSU is offering some of these programs for a limited time at no cost. Some of these programs can be used for required refresher training. Funding for these programs is generated through a federal grant. Michigan State University will provide electronic certificates available for printing to those who complete each course with a passing grade. A representative from your employer will need to provide a signature on the certificate for proper documentation. List of safety notices and recalls for thousands of products. Searchable by product type or manufacturer's name. The mission of the international nonprofit NFPA is to reduce the worldwide burden of fire and other hazards on the quality of life by providing and advocating consensus codes and standards, research, training, and education. NFPA membership totals more than 79,000 individuals from around the world and more than 80 national trade and professional organizations. FEMA is part of the Department of Homeland Security's Emergency Preparedness and Response Directorate. FEMA has more than 2,600 full time employees. They work at FEMA headquarters in Washington D.C., at regional and area offices across the country, the Mount Weather Emergency Operations Center, and the National Emergency Training Center in Emmitsburg, Maryland. FEMA also has nearly 4,000 standby disaster assistance employees who are available for deployment after disasters. Often FEMA works in partnership with other organizations that are part of the nation's emergency management system. These partners include state and local emergency management agencies, 27 federal agencies and the American Red Cross. As an entity of the Department of Homeland Security, the mission of the USFA is to reduce life and economic losses due to fire and related emergencies, through leadership, advocacy, coordination, and support. We serve the Nation independently, in coordination with other Federal agencies, and in partnership with fire protection and emergency service communities. With a commitment to excellence, we provide public education, training, technology and data initiatives.